Sergey Yenin, a vice chairman of the LGBT Human Rights Group GayBelarus.By and co-organizer of the Slavic Pride in Minsk shares his first-hand experience. 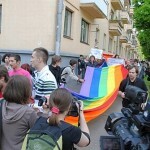 Gay Pride March took place in Minsk on May 15. After some 200 meters, it was broken up by the riot police with twelve participants arrested after scenes of reported police violence. According to UKGayNews*, these are probably the most dramatic 1,000 words written about a Gay Pride event anywhere in the world this year. Arrested, Beaten, Threatened, Jailed and Sent for Trial Just for Taking Part in Slavic Gay Pride …Yet PROUD of what we all accomplished in Minsk By Sergey Yenin MINSK, May 19, 2010 – This is an account of the most dramatic 48 hours in my life as a gay activist in Belarus. There were four of us in the taxi. Myself, Logan (and Australian filmmaker), Jack (his boyfriend) and Chad (a photographer working on a project Walk with Pride). I couldn’t help shivering in anticipation of the upcoming Pride march and the possible extreme few hours that I would probably face. But I couldn’t let my friends worry as well. The taxi driver noticed that something was really wrong with the place he had to drop us off. The United States has extended the suspension of sanctions against Polotsk Steklovolokno and Lakokraska until November 30, 2010. 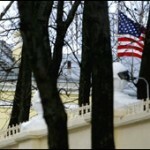 Other related U.S. sanctions in Belarus continue in force. Unfortunately, recent events, including raids on an NGO last week, indicate a continuing, negative pattern in the Belarusian authorities’ respect for basic freedoms. An improvement in U.S.-Belarusian relations can come only when there is real progress on respect for democracy and for basic human rights. This situation will be a factor in our consideration of whether to continue the selected suspension of sanctions in November.